Grace is the story of, in the words of playwright Craig Wright, "A man who believes God is on his side coming face to face with the fact that that just isn't true. Disastrous consequences ensue." Throughout the performance, we clearly see how the male characters let their pasts define who they are and somehow feel restrictions - whether condemnation or elation, from a higher power, be that God or not. We also see a theme of how we let man's damages leave their mark on us, viewing all the man-imposed standards of good as right. But who is to say how God's true divinity in our lives really manifests? 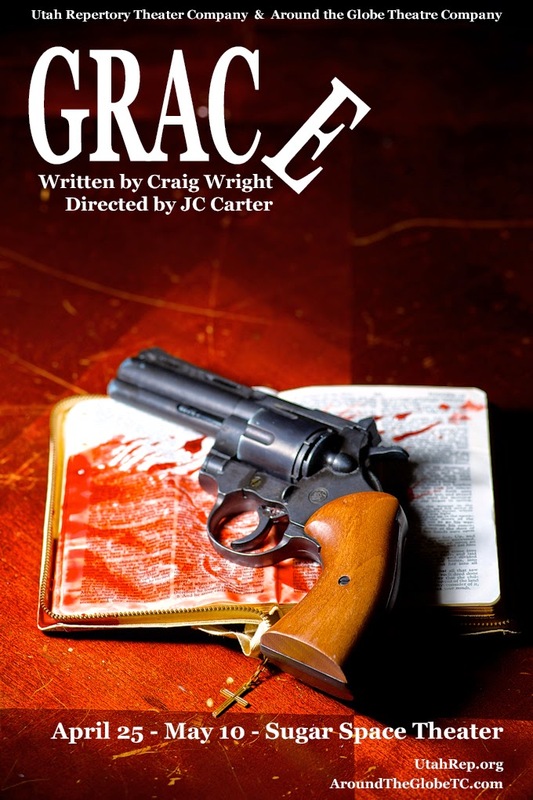 Utah Repertory Theater Company's performance of Grace perfectly demonstrates everything that is wrong with Christianity in the character of Steve, performed with crazy-eyed furiosity by Johnny Hebda. What are the two biggest things you think of when you think of Christianity gone wrong in the state of Utah? Did pushy sales people and overzealous, relentlessly forced conversion tactics cross your mind? I giggled a little when I wrote down, "Jesus freak," in my notes, only to have another character refer to him as that exact thing not even ten minutes later. In perfect contrast to Steve's warped view of his self-created divinity, Emilie Eileen Starr as Sara is a gentle example of what is truly divine through unconditional love. Her motives are not purely based on trying to convert or sell something to anything that breathes. Sara wants everyone to feel love in their lives, a theme a well-loved blockbuster musical has made familiar - "To love another person is to see the face of God." She knows this and feels this. Steve is as far removed from this reality as they come - only capable of loving those who believe exactly as he believes. Shortly after we are introduced to Steve and Sara, we meet elderly Karl, the exterminator at the apartment complex, played with crotchety vivaciousness by Jeffrey Owen. I was shocked to see his photo and realize he is actually quite youthful. His character brings humor, as well as that established feeling of an apartment complex with people from all walks of life - that history you want to feel well-rounded as a people. Jayc Stoddard as Sam, our scarred NASA employee, has a storyline that shows us how life can change in an instant, as well as his demeanor. The audience sees how this gentle, loving, successful man before his accident, has turned into a scornful recluse. His attitude often switches from viscious to remorseful in the snap of a finger, but the way Stoddard plays this character makes this make sense. You see how he's let darkness into his life and always immediately realizes where there could be light. Utah audiences need to know that Sam's exclamation of choice is the notorious "F word," which he begins to correct himself on throughout the show - another exemplification of how his life becomes more and more light through the influence of the good (Sara) around him. I previously mentioned the aging of Jeffrey Owen into elderly Karl. Kelly Donahue brings to life her wonderful makeup design. The scars on the face of Sam, the scene-by-scene spreading rashes of Steve, and the aging of Karl were all beautifully created. Speaking of beautiful creations, the stage direction of the show really struck a chord with me. Every actor occupies the same space on stage, representing several actual spaces. In the Director's notes, we see this perfectly explained through one of Sara's lines, "We're here together. The idea that we're not all in any way somehow here for each other but just somehow beside each other is just stupid." We are all here together, occupying the same space. Another creation in the stage direction I particularly enjoyed is the use of the "replay." In life, we are always asking ourselves, "What if I could go back?" But you can't go back in life, you can't change what has already happened. The replays in this production demonstrate the inability to change the past. In regards to the set and other technical aspects of the show, with a four-man show in a space that only seats 90, there isn't much required. No microphones were used, which I always prefer, as the actors natural cantor and intonation is better than anything electronic and prevents the ridiculous feedback problems that plague Utah theater. The background Christian music was a nice effect between scenes, as the scene changes felt long, but when you realize the actors were changing wardrobes, hair, and makeup within those 60-seconds, you quickly forgive the time. I also loved the slight hum and sound of water running as background, making me feel as if I were near a coast in Florida - unfortunately I was duped because the show ended and I realized it was the hum of the utilities in the building, so I guess I can't give Utah Rep credit for that choice. Grace is a show that will make you think. There are no bright and happy musical numbers, no elaborate and colorful sets, but there are characters and themes that will encourage you to contemplate your situation in life and your choices for light and happiness therein. I highly recommend this show, however, if you are even slightly offended by harsh language, I would suggest you stay away from this production. For those who attend, you will be touched. You can catch the final two performances of Grace for $15 at Sugar Space this Saturday May 10 at 2pm and 7:30pm. You can purchase tickets here. Great review! I loved the show too, but I feel like your review said it much better. Thank you for putting it into words so well!